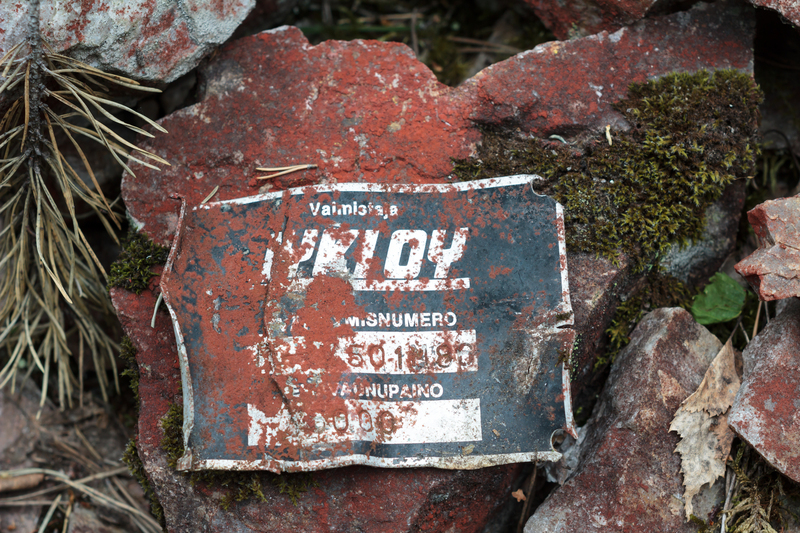 We packed our cameras and a geiger counter and started car at this cloudy sunday afternoon.First place we drove was small testing excavation in Koli’s national park. With help of gps navigator, we arrived along small seemingly abandoned gravel road that had fallen trees and low hanging branches all over it to small clearing that had two rock pit near. 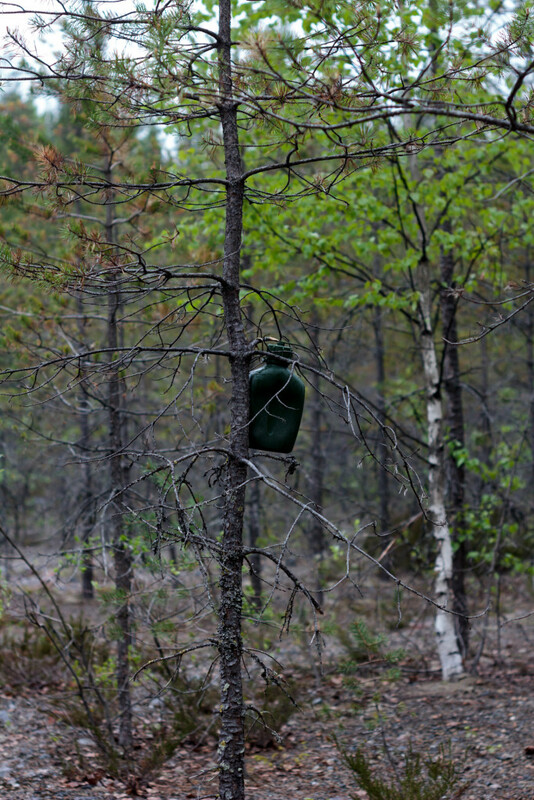 It must have been one of the many testing sites around the area. Just as we were unpacking and turning our geiger counter on, old man arrived to site, and asked us “are you finding any atoms?” We talked little bit, and that man clearly knew, what was behind these small holes in ground. 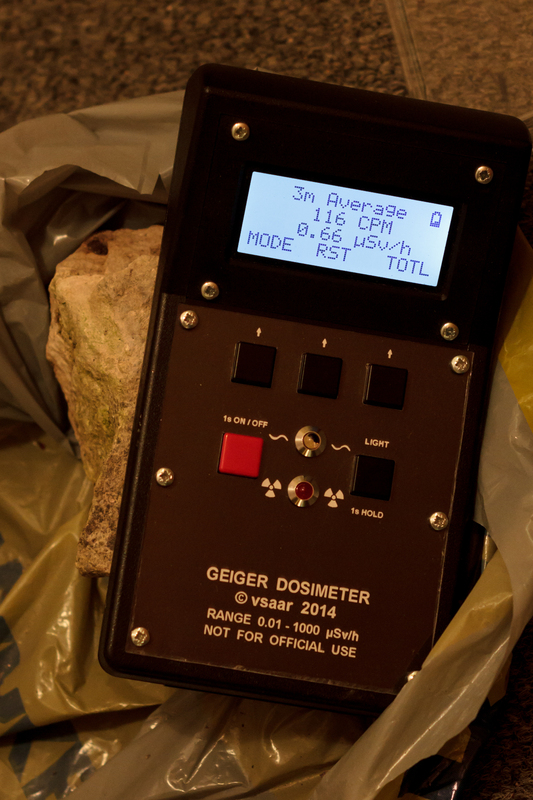 Soon after geiger counter made it’s first average measuring cycle high background alarm went off. Jackpot, we had found something more interesting that just boring rocks. Radiation level rose while we were standing just front of the pit, and reached 0.72µSv/h. Not so dangerous levels yet, but somewhat same as one would get while standing in middle of Pripyat in pavement. 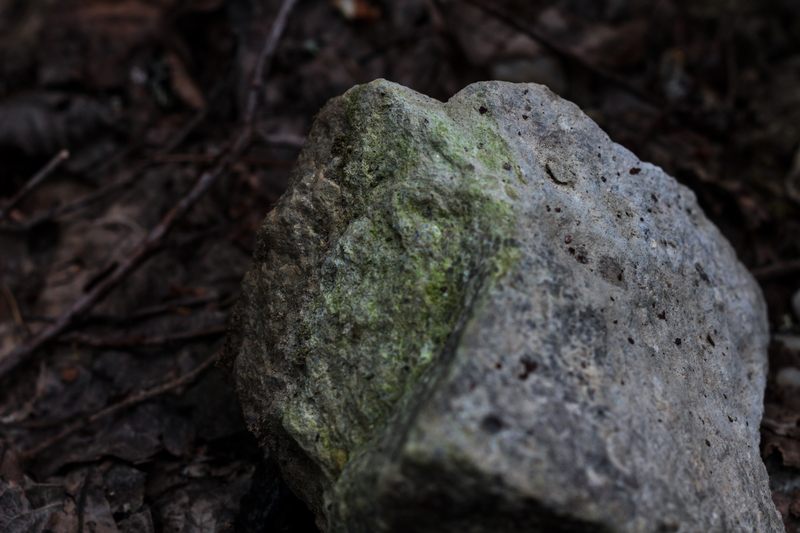 Just innocent looking rocks in ditch. Without radiation detector no one would question these. 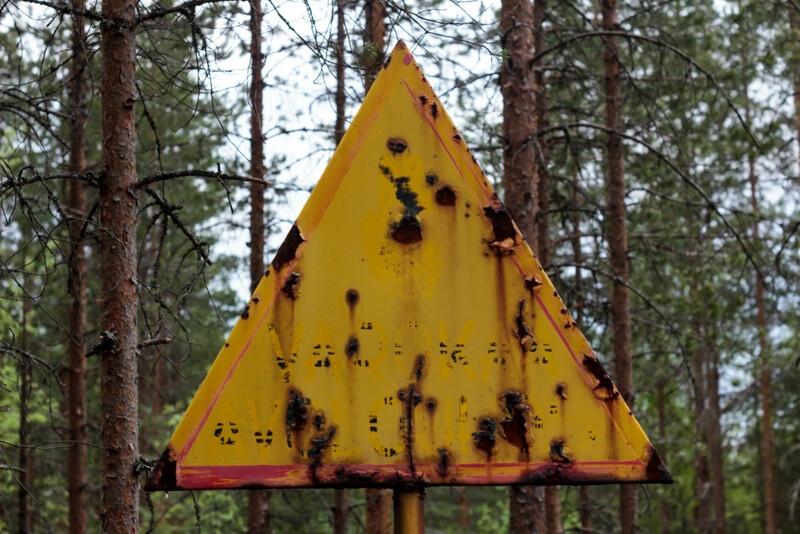 I spotted yellow sign nearby, and was exited it would be radiation danger sign. But with closer inspection it just said “CAUTION Open-pit mine”. Meanwhile my friend had made first ground measurement. 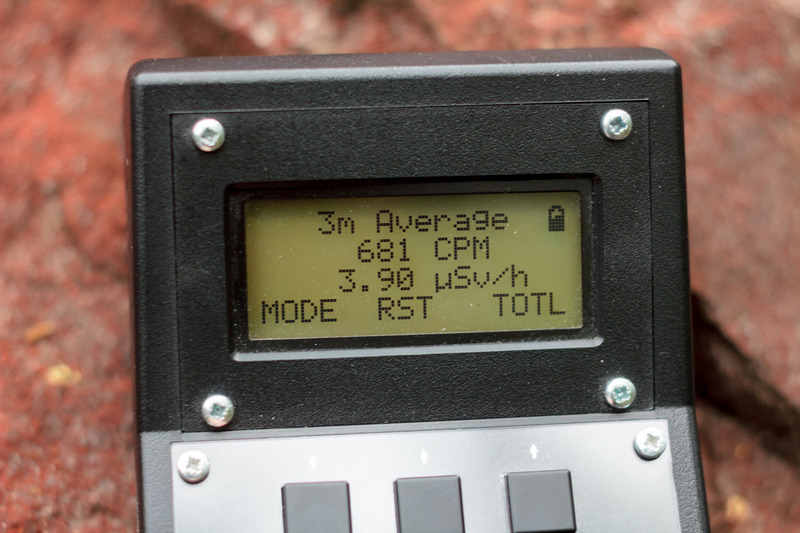 1.8µSv/h, quite high reading. And this is natural radiation, from bedrock rich of uranium containing minerals. After some photographs we took closer look of these rocks. Most of them were covered in something red. 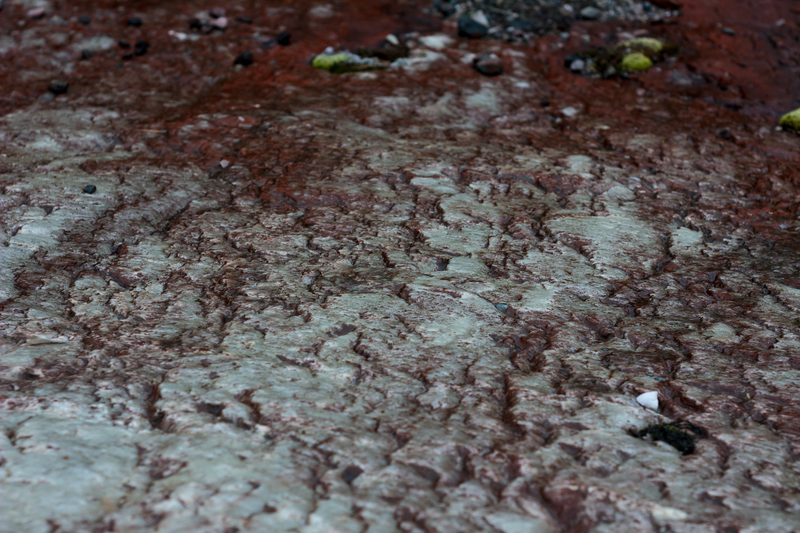 We are not sure if this was paint, rust or minerals. 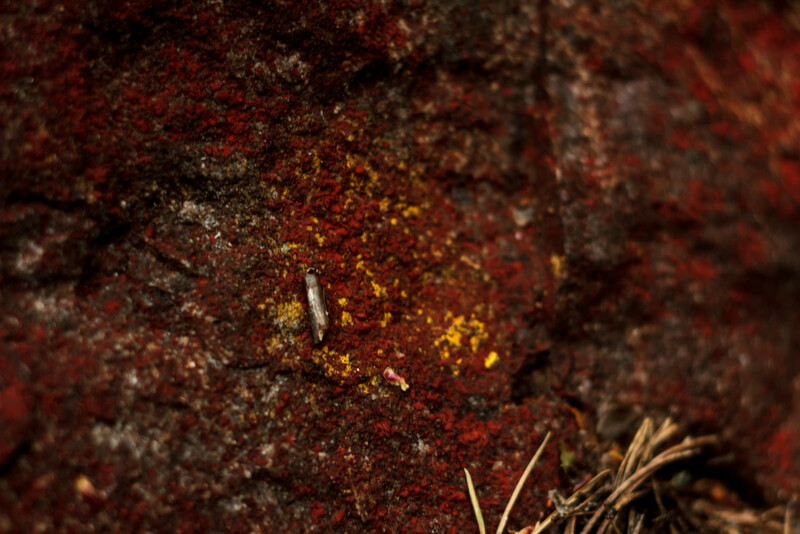 It could have been red lichen too, as it covered old serial number plate of vehicle or machine too. 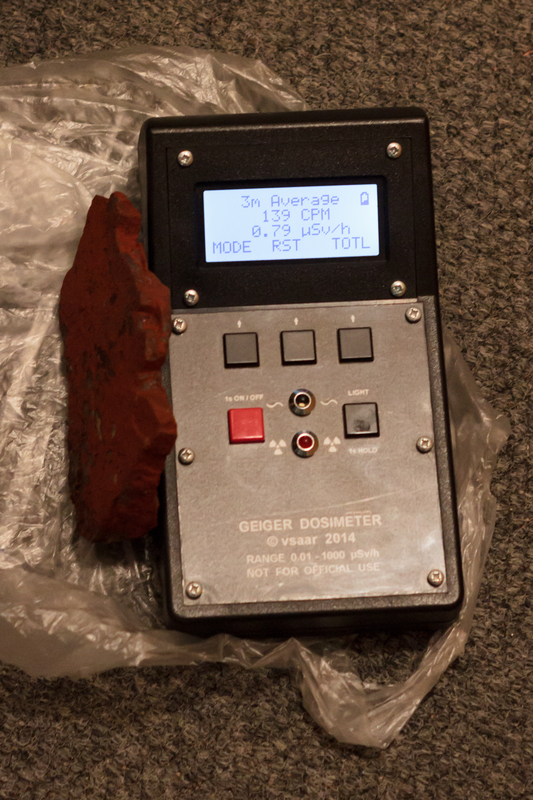 Our geiger counter placed on top of these red rocks gave much more tics, wort of just under 4µSv/h. We remembered that enriched uranium looks like yellow powder, called yellowcake or urania. 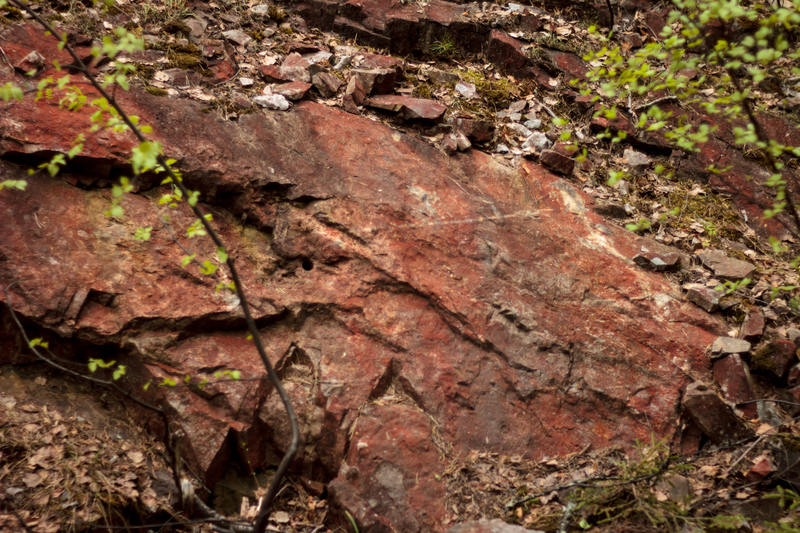 Indeed, there was yellow streaks in these radioactive rocks. We did not have an UV-lamp to confirm if it would be fluorescent, like uranium ore usually is. 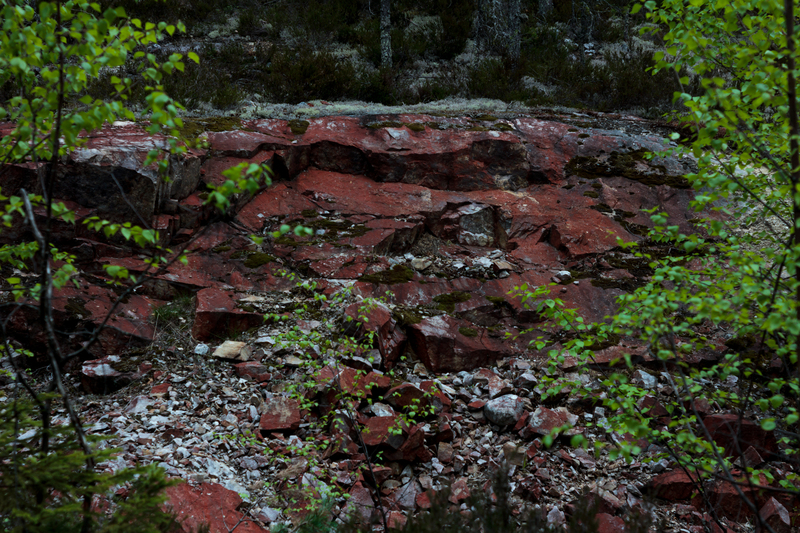 It was also very staining as my shoes and trousers got yellow spots after climbing on these rocks. Not good news if it really is uranium. 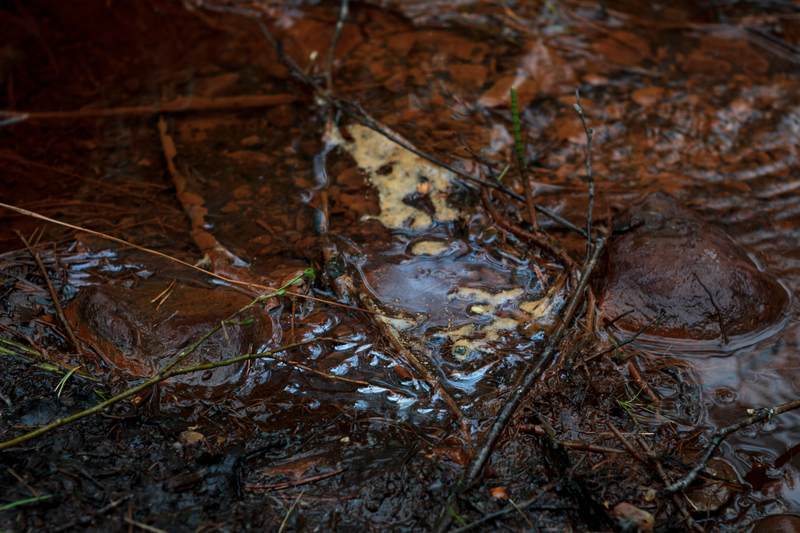 But uranium in this form is really, really low active, and does not pose much of health risk. I could not detect it with geiger counter and we washed our hands and shoes after. On these yellow spots radiation reading was much higher than elsewhere. This rock had several sample drill holes. We got our highest reading from this area. Over 1000 counts per minute! 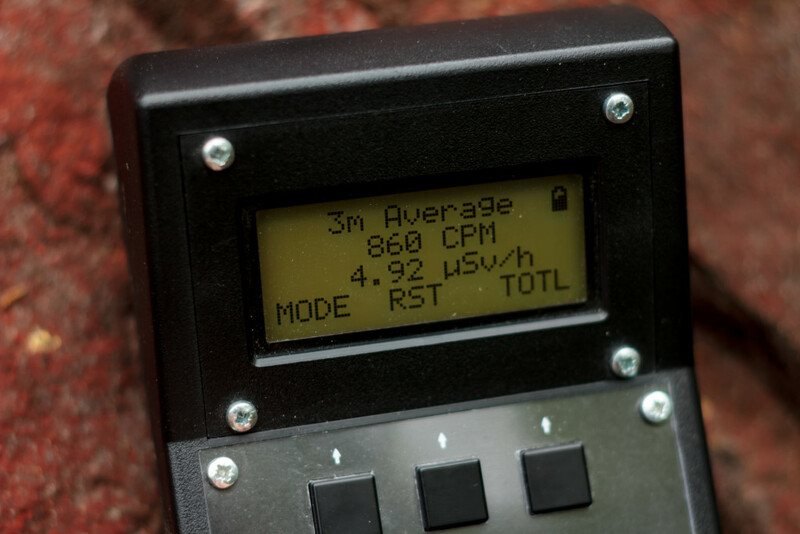 Totaling dose rate of 6.11µSv/h. 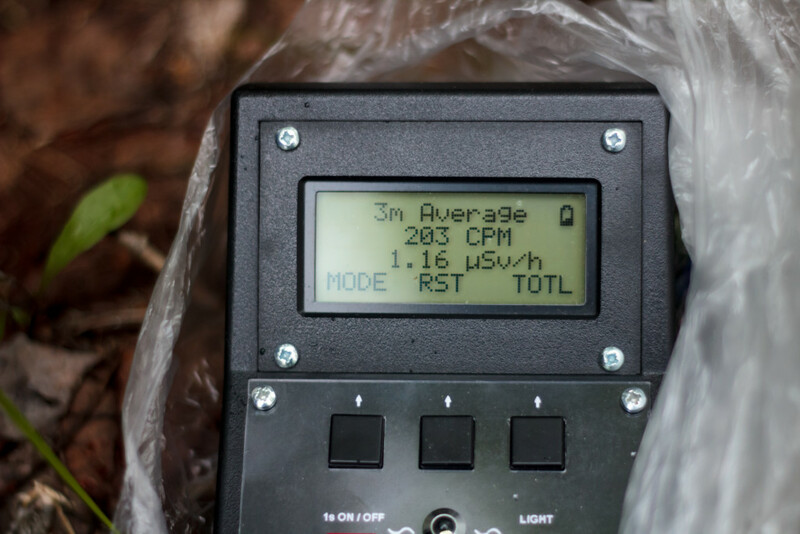 Our meter could not detect alpha radiation, so actual count would have been higher as uranium and it’s cousins are mostly alpha decays. Alpha is so weak that it can’t penetrate even paper. It has not match of plastic and metal housing of geiger counter and tube, and our clothes and skin provides adequate protection. After this clouds started to get thicker and it got dark fast, so we packed our equipment, washed our hands in small water ditch nearby. 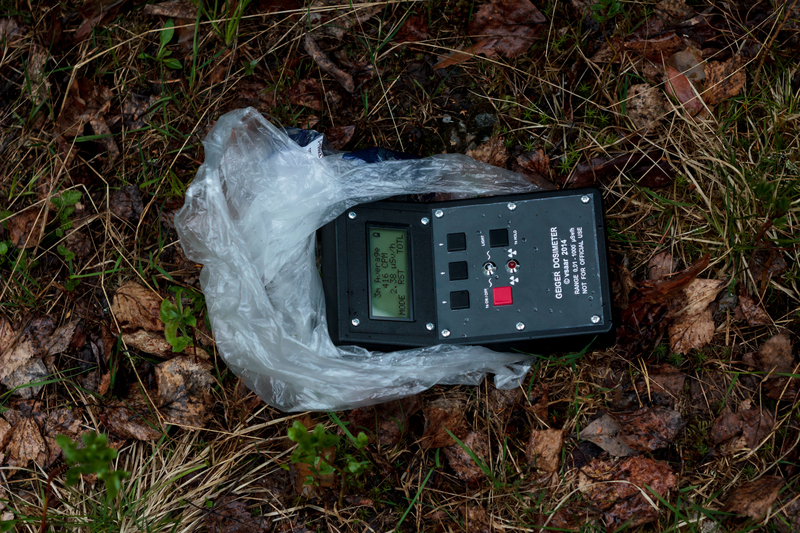 Background radiation was no more than 0.1µSv/h in car couple of hundred meters away from site. 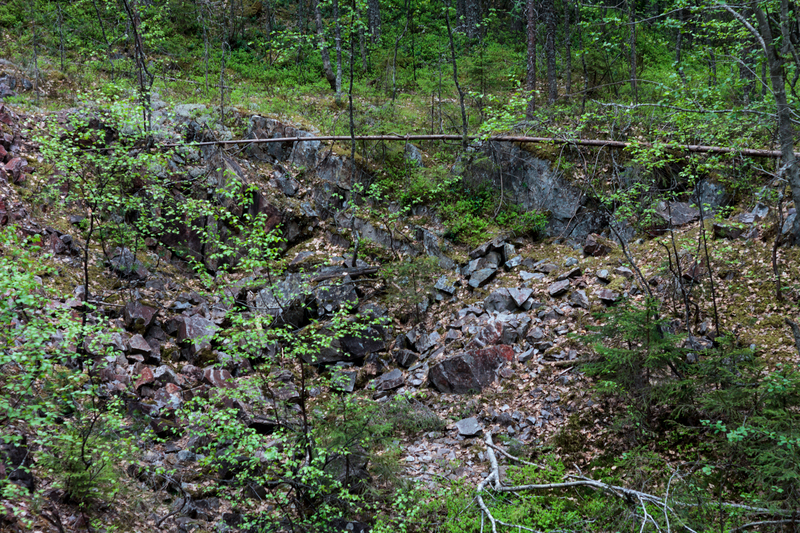 We continued our adventure to next place, the main mine of Paukkajanvaara. Paukkajanvaara’s mine was cleaned and rehabilitated in 90s, so it wouldn’t be anymore so radioactive than in old days. 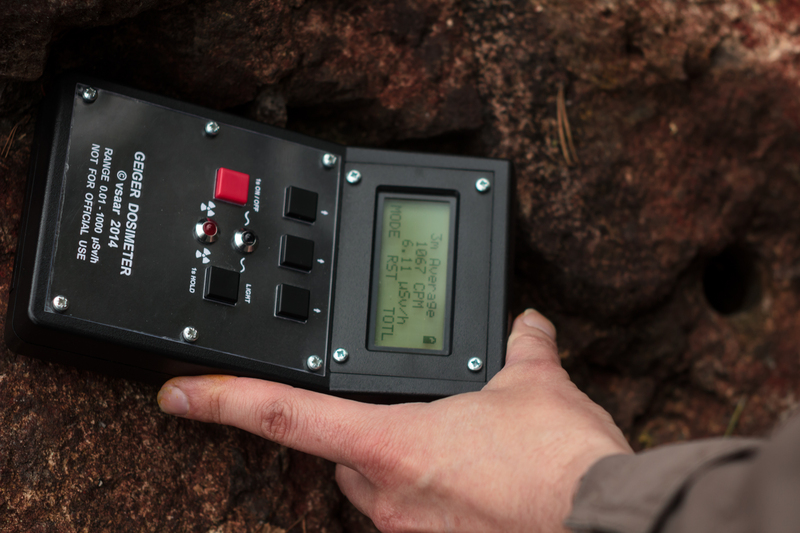 As we parked front of closed mine, our Geiger counter gave alarm again inside the car. 0.60µSv/h. Unknown to us, we had parked just on top of buried hot spot. For some reason in front of mine, before radiation danger sign, there was something that radiated strong gamma rays (as they could penetrate car). 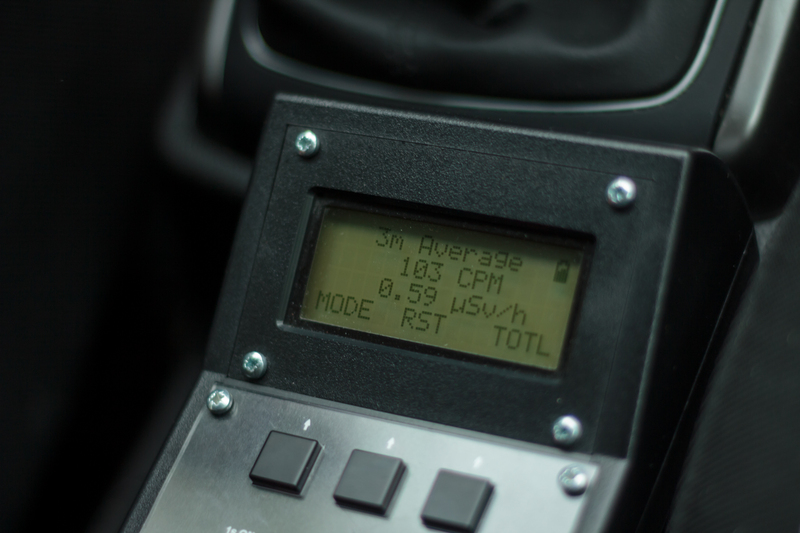 Dose rate of 2.38µSv/h just behind our car. 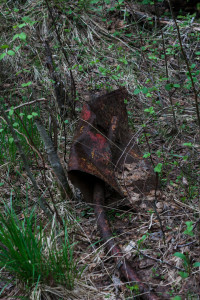 There is something unknown buried here. I wonder if it is just spilled concentrated uranium ore, or if there is some highly radioactive test source down there. Without gamma spectrometer we can just guess. 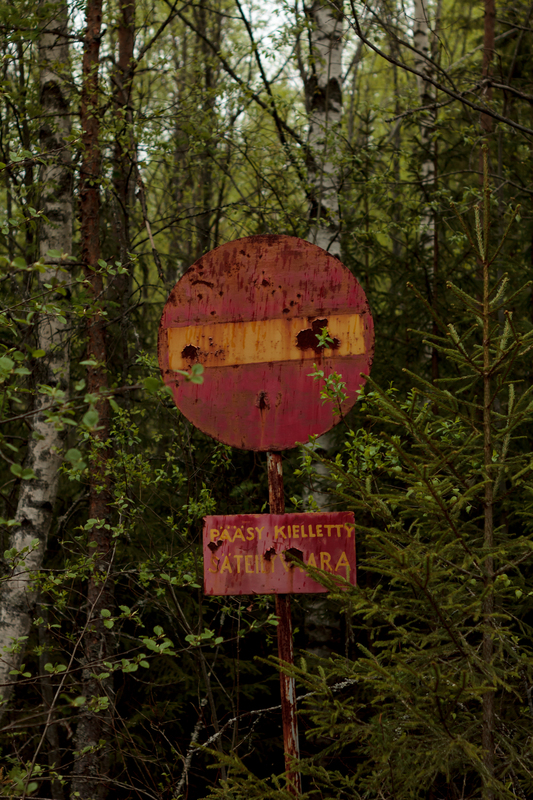 Old abandoned radiation danger signs in front of decades old mining site. 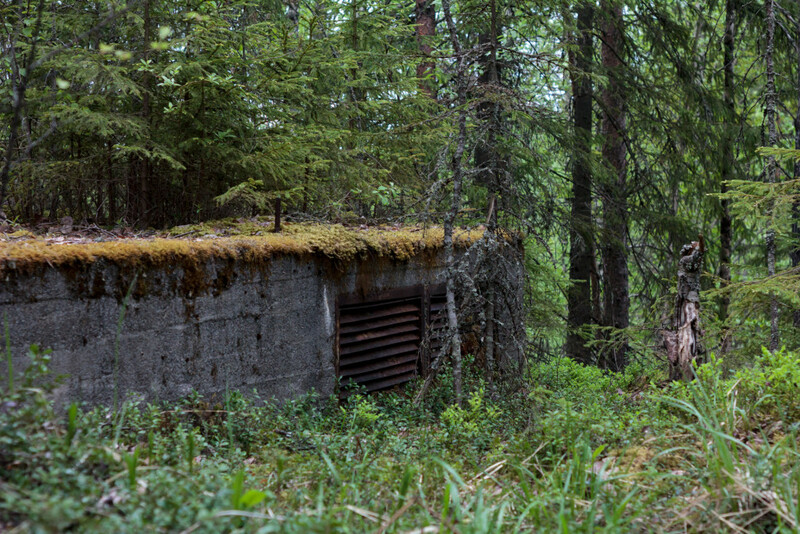 Access to this site is not anymore restricted, and official documents say it is perfectly safe to explore area, even to pick up berries and mushrooms from there. Getting construction permit for site is still impossible (and will stay like that forever, as uranium has longer half-life than our civilization. I would not either pick any edible ingredients from there as there are still spots that are not well covered. Not knowing sites history, it would be impossible to guess that there was 55 yeas ago operational mine. 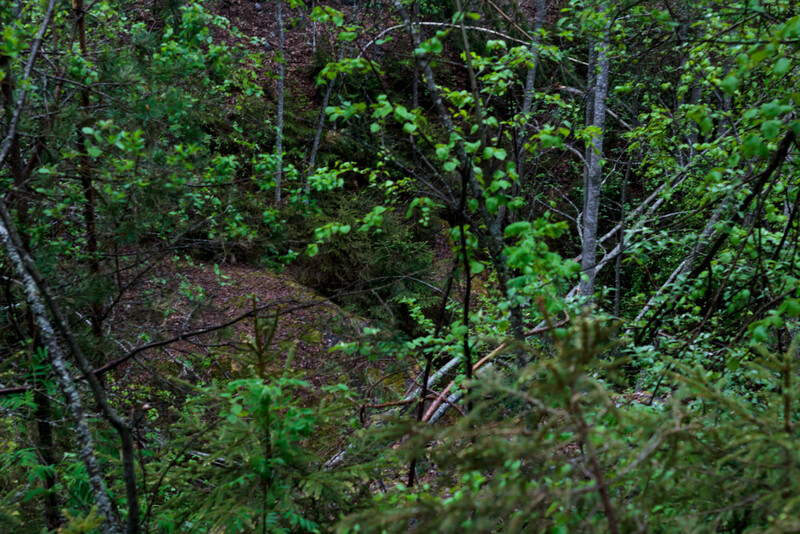 All excavations and mine shafts, buildings and machinery have been buried and new trees have been planted in 90s. 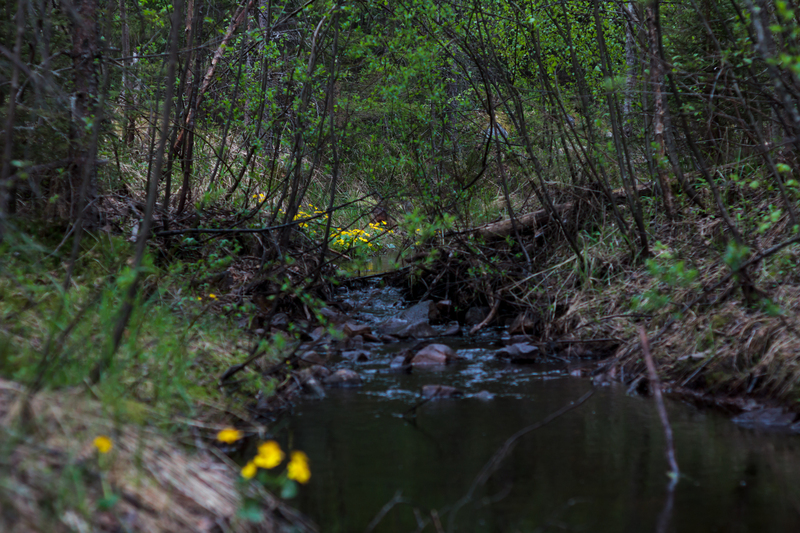 Whole area was peaceful, just trees and small underbrush, trails of deer animals visible by hoof imprints and poop. Our geiger counter gave just bit above of normal background radiation, about 0.2µSv/h. 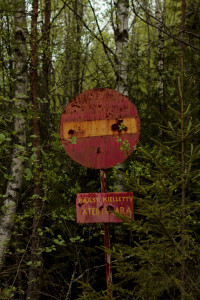 My friend had visited this site before, and could tell that most of the area was pretty well covered and there were no radiation left excluding couple of hotspots. We continued deeper into the forest. 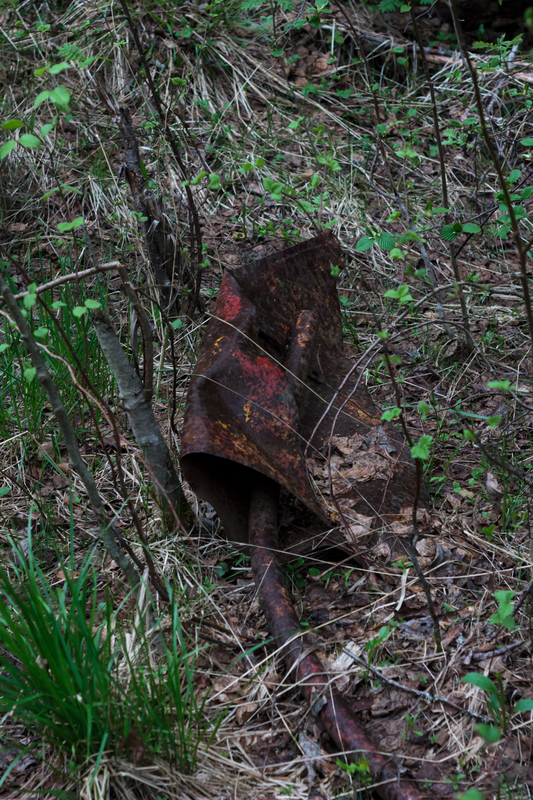 We found only few signs of old mine, some concrete foundation and some rusty scrap metal sticking out of ground. 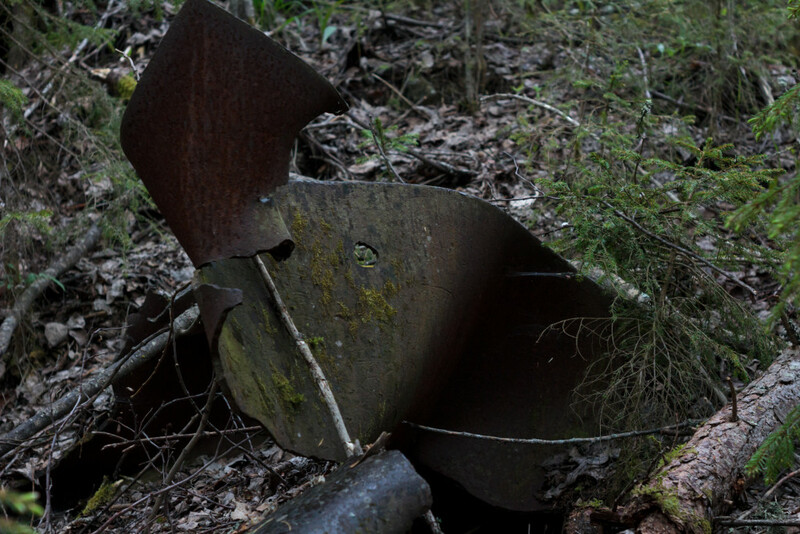 We found spot where uranium enrichment facility would have been before. 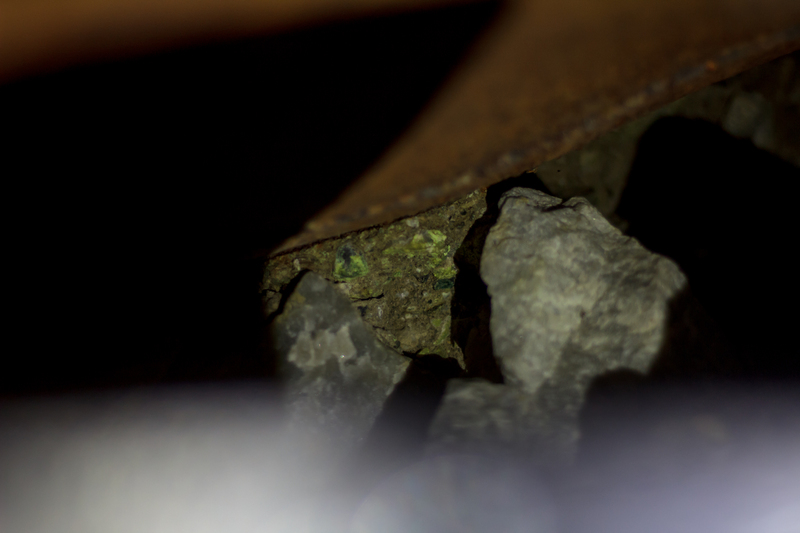 Under one of the larger metal pieces we found unburied spot with interesting looking mineral stones. 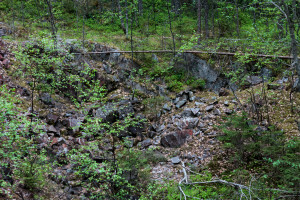 Highest reading of whole buried mining site, maybe they had left just one spot unburied here. 1.55µSv/h under the scrap metal poking out of ground. We took some stone samples with us to examine them later. 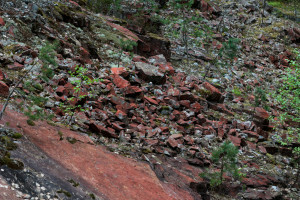 We found yet one more hotspot in rocks. Light started to drop out, and it was raining slightly, so we decided to pack our stuff and head to back home. Evening went nicely by making pancakes and drinking well-earned beer while discussing our findings. 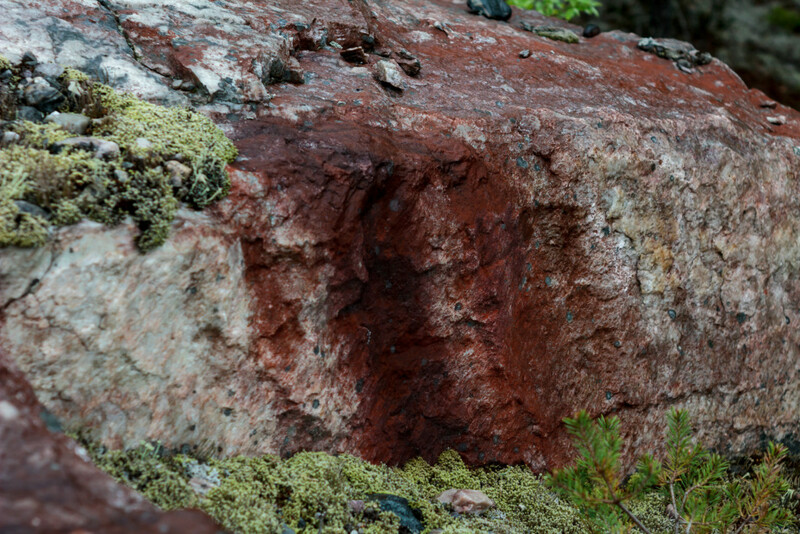 Stone samples we brought from Paukkajanvaara proved to be slightly radioactive after washing them out of external contaminants. They give 0.60-0.80µSv/h dose rate making them safe, but interesting novelty paper weights. 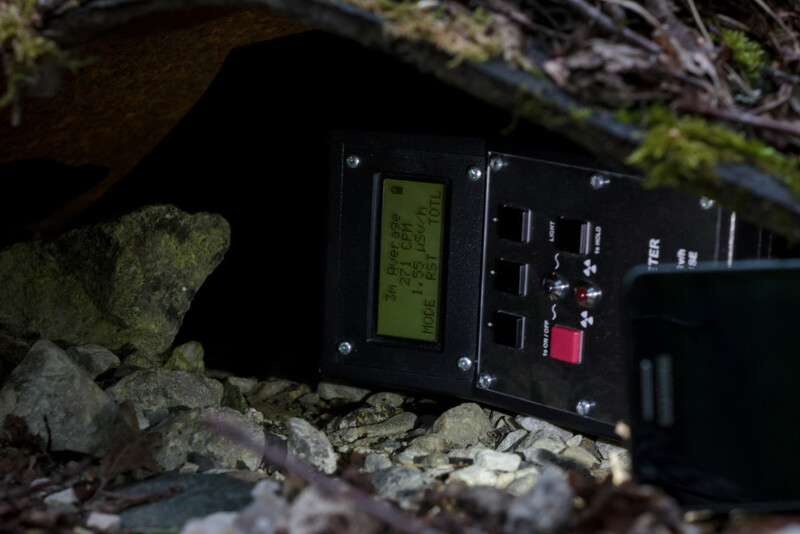 Maybe if I someday have access to more accurate equipment, I could test them to see what radioactive elements they contain (my guess is they have small amounts of uranium and it’s decay products. For those concerned my well-being, no, I did not grow extra hand or feet after this trip. 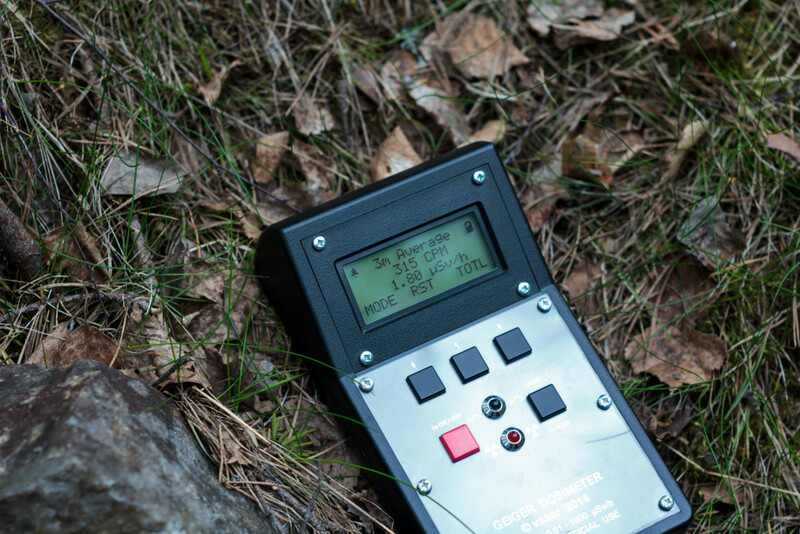 Our geiger counter showed whole dose for trip under 2 µSv, and we did not lay or sit those rock, or spent too much time near them. We didn’t get probably even 1µSv whole dose during trip, nor where there any detectable contamination to our clothes or equipment. For caution we still washed our hands and stuff that touched radioactive material. 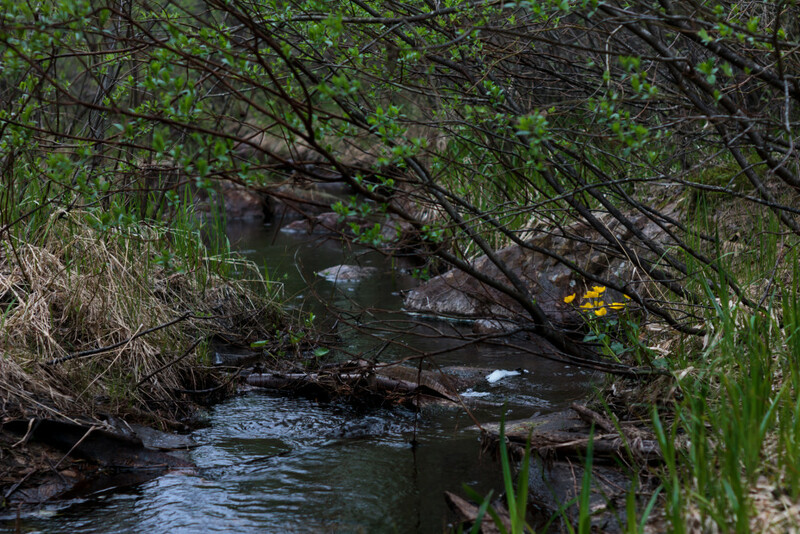 Radiation does not make you radioactive by staying in radiation field, it is not something you could catch, if no radioactive particles are ingested large amounts. Uranium is also pretty safe radiation source, it is not chemically that poisonous, and it is expelled quite fast from body, even if it is got from there. Some other radioactive heavy metals are another story. Only side-effect of this trip was I ripped my shoes and trousers in the woods, luckily they were not my best clothes anyway, so no big loss. For the record, you can get 80µSv dose of radiation during cross Atlantic flight from Europe to USA due cosmic radiation. 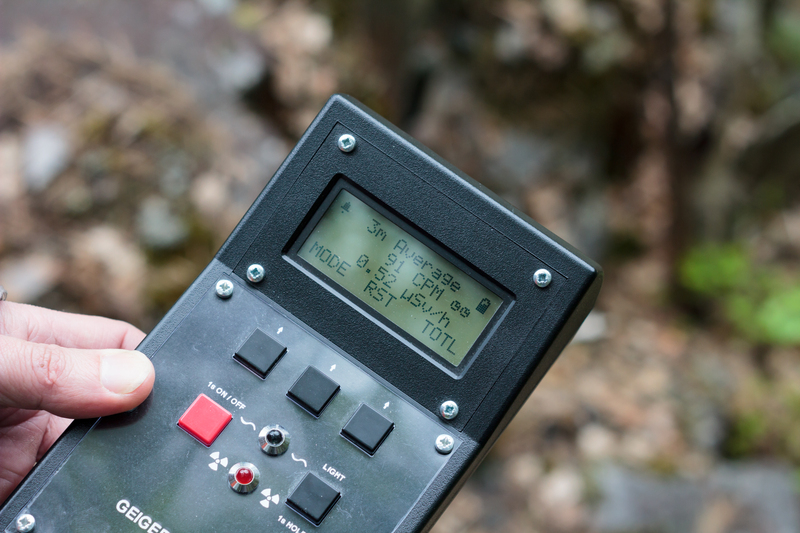 It is 13 times more than spending a day in uranium mining site with 1µSv/h background radiation rate. 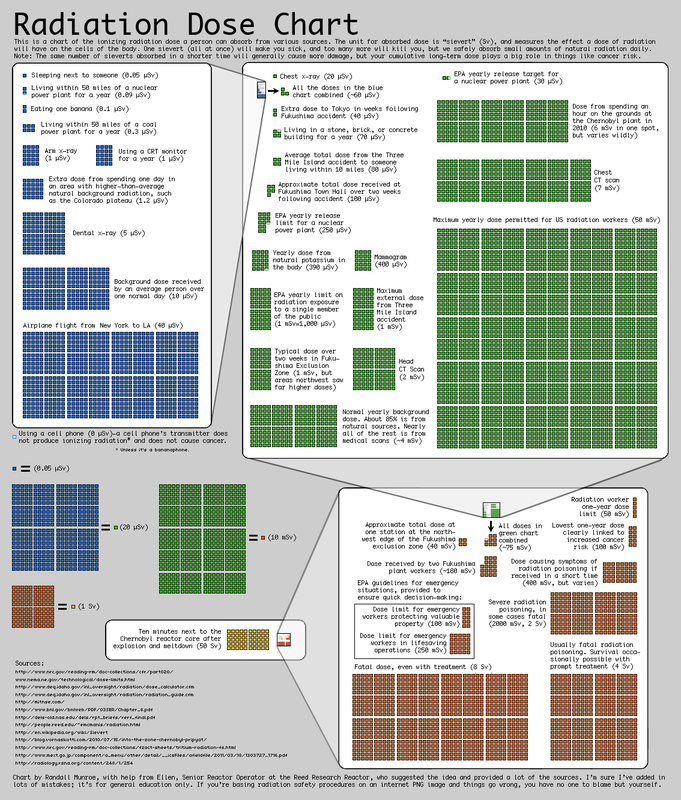 Here is XKCD’s infograph of radiation dose for comparison. We got about as much radiation as one gets when eating 10 bananas. By laying on top of highest hotspot we found (6µSv/h) for one month 24/7, you would get same spot dose of radiation, than you would get in year from other sources by average. And that’s why why I am pro-nuclear, because radiation is not so bad for you, If nothing goes really, really badly wrong, Chernobyl wrong so to say. 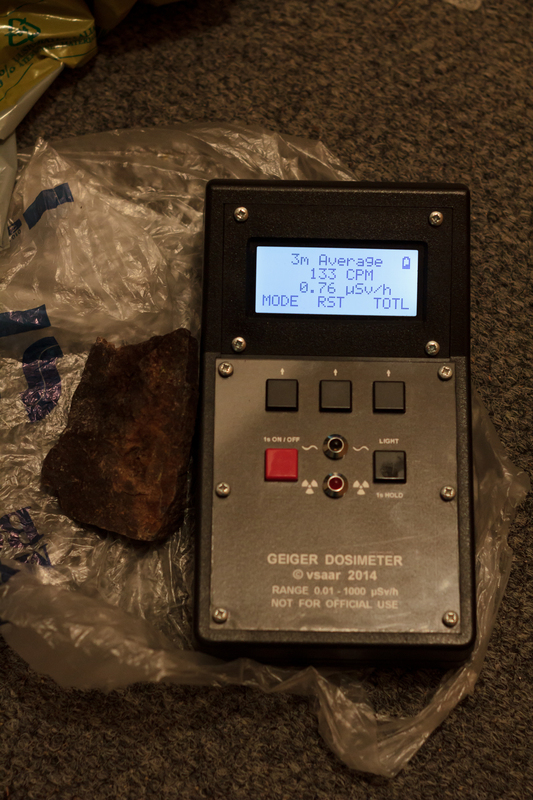 Thanks to vsaar for accompanying me, and making whole trip possible by providing transportation and geiger counter (mine is still somewhere in moving boxes in storage). 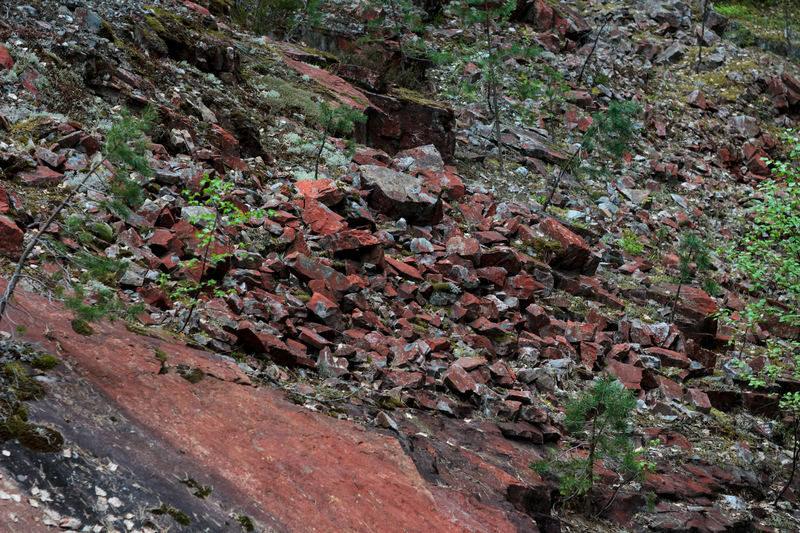 This was really rewarding day and maybe someday we will continue exploration of this site.